Guvera will assign a special playlist to each university. These will be hosted on the app and winners chosen based on most streamed playlists. Australia based music streaming service Guvera, has announced the launch of the ultimate ‘University Stream Off’ contest across India. The participants of the contest includes some premier Indian educational institutions who willbe battling out with each other to rank as the top institution that's tuning into the global trend of music streaming. Each of the participating educational institutions has been assigned a special playlist that is hosted on Guvera. The playlist is available under the channel 'University Steam Off'. The contest will run from August to September and 5 winners will be selected on the basis of most streamed playlists. The winners will be elgible for a sponsorship offering from Guvera for their annual fest. 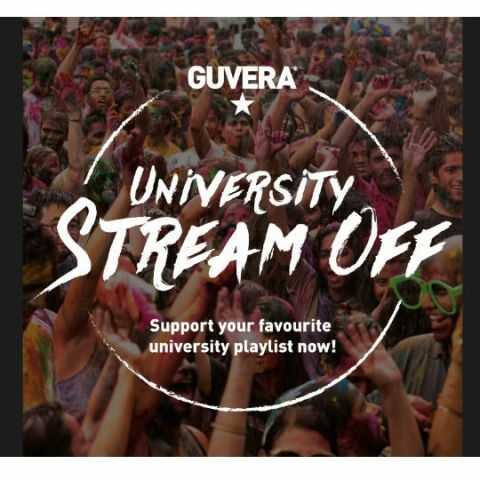 Australia based music streaming service – Guvera has today announced the launch of the ultimate ‘University Stream Off’ contest across India. In the first-of-its-kind initiative, the activity is a music streaming competition being held in some of India’s most premier educational institutions. The contest will feature the shortlisted universities battling it out to rank as the top 5 institutions tuning into the new global trend of music streaming. As part of the contest, each participating university has been assigned a special playlist hosted on Guvera, under the channel ‘University Stream Off’. The contest will culminate in the first week of September and will crown 5 universities as winners, basis the most streamed playlists through the months. Winners of the contest will be eligible towards a significant sponsorship offering from Guvera towards their annual festival, and other gratifications. The contest will see Guvera driving its freemium offering amongst the universities through specially curated playlists by the company’s in-house content management team. This marks as Guvera’s first ever significant on-ground event in India, which should serve as a timely, strategic outreach towards its potential users in the country. With a view of tapping into the popularity of some of the most influential annual cultural jamborees, the music streaming service will use the platforms as a direct marketing tool to build its brand visibility and reach. Over the next 2 months, Guvera will gain a substantial number of users across key consumer and market demographics that drive new age media consumption across a billion-plus population. Although at a nascent stage, Guvera believes the potential in the Indian market can be humongous, as the company itself has witnessed a significant growth in user base, breaking the 5 million benchmark since its launch in November 2014. From hosting locally curated playlists, to offering the next stage in-app advertising for brands through its ‘Branded channels’ feature, the initiative marks another significant investment by the company in distinguishing itself in the market.